It was the perfect day for snorkelling for the students of Deutsche Schule Kuala Lumpur on Pulau Tioman, not a cloud in the sky and the sun in our eyes as the song goes. However, as the students swam towards the coastal mangroves of Tulai, something appeared to be floating in the waters right in their paths. It was an illegal fishing net 7m long, strategically positioned just outside the mangroves to capture fish returning to the reef with the tides. The area 2 nautical miles around Pulau Tioman is designated a Marine Park and Tulai falls within that radius and hence no fishing should be done there. “There’s a turtle, there’s a turtle! Oh no is it dead?” Jule Zuber of DSKL exclaimed as she gently lifted a flipper, having spotted the carapace floating among the net. A gorgeous juvenile hawksbill turtle about 35cm across had been entangled. Thankfully, this little guy was entangled at the surface and did not drown. In fact, the distressed turtle responded to Jule’s probing with futile little finning motions against the thick tangle of the net. The fishing net was brought back to the boat and with the help of DSKL kids, two crabs, still very much alive, were released as well. Hawksbill turtles have been hunted extensively for their shells which make attractive tortoise-shell jewellery, brushes, eyeglass frames and rings. 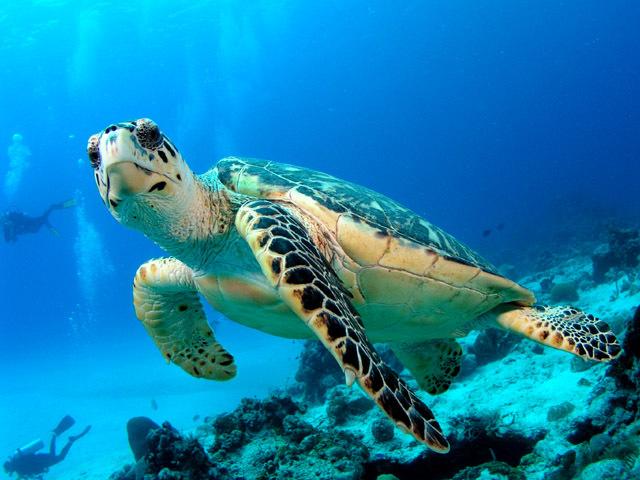 In some parts of the world such as China and Japan, the hawksbill turtle is also eaten as a delicacy. So badly decimated are the hawksbills that these turtles are listed as critically endangered on the IUCN Red List. 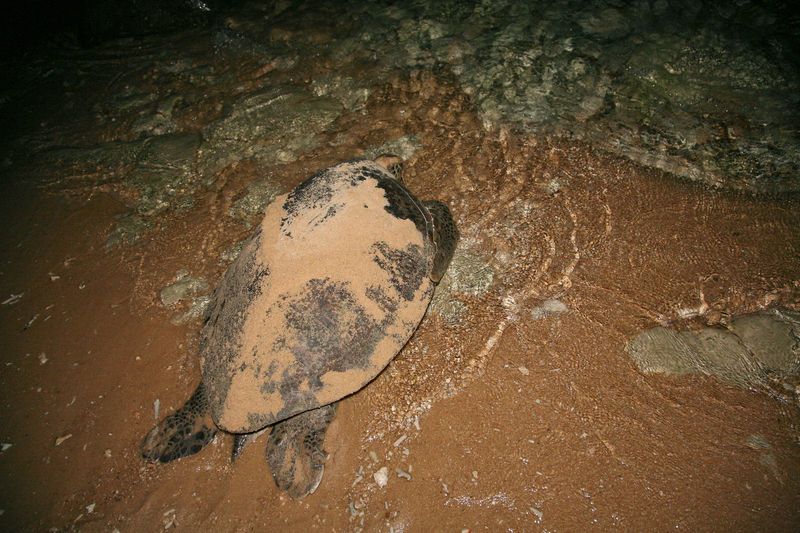 Fortunately for this juvenile hawksbill turtle, it lives to see another day thanks to the alert students of DSKL. The first hatchlings of 2010! The excited cries could be heard halfway around Tioman as school students and staff dropped what they were doing and ran to take a look. On the 25th of May, Melina Beach Turtle Hatchery welcomed into the world the very first batch of turtle hatchlings for the season. The baby Green turtles had spent 62 days beneath the sand and chose to emerge from their nest late on a sunny and warm afternoon. Perfect timing! At Melina Beach, turtle youngsters are kept safe in the hatchery until sunrise or sunset to prevent the bright lights of Tioman resorts confusing them at night. Counting the turtle hatchlings and checking to make sure they are A-OK! Before their release, the Ecofieldtrips staff checked and counted each hatchling. The delicate and time consuming job was gladly accepted by two of the newest members, Tara and Ling. Neither had experienced a hatchling release before and were instantly charmed by the swarm of frantic tiny flippers. Out of the 119 eggs that were buried in the hatchery, a whopping 116 happy and healthy hatchlings emerged! This is a fantastic result; not only for the turtle hatchery’s already high success rate, but for the threatened Green sea turtle population. Unfortunately, unsustainable fishing techniques and egg poaching is taking its toll on many turtle species. Greens are listed as ‘endangered’ by the IUCN. The extremely lucky year 7 students from TTS and some students from Seoul Foreign School became the envy of every school this year. The unexpected turtle hatching event occurred in the middle of their fieldtrips! 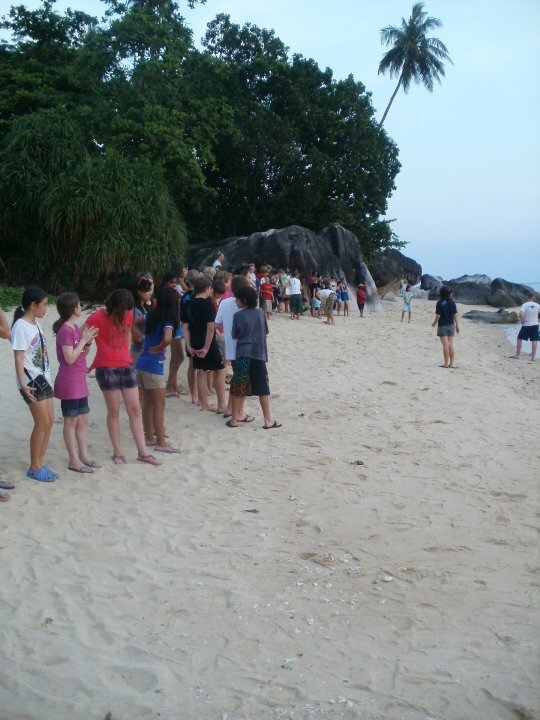 Over 100 eager students lined the beach under the infamous sea pandan tree where the turtle mother originally laid her eggs. Each student released one baby turtle and watched them scamper down the beach. The little whippersnappers were wished the best of luck as they left the sand and entered the big blue. Nobody really knows what happens in the life of a baby turtle, but as we watched, a myriad of tiny heads popping up for a breath of fresh air could be seen disappearing into the distance. Another Green turtle has laid her nest on the beach adjacent to Melina Beach! Unfortunately, this time there were no witnesses, but high tide meant that no unwanted visitors made it to the nest that night! Ecofieldtrips’ Managing Director Bridget Hedderman was informed of the nest early in the morning of the 4th April. 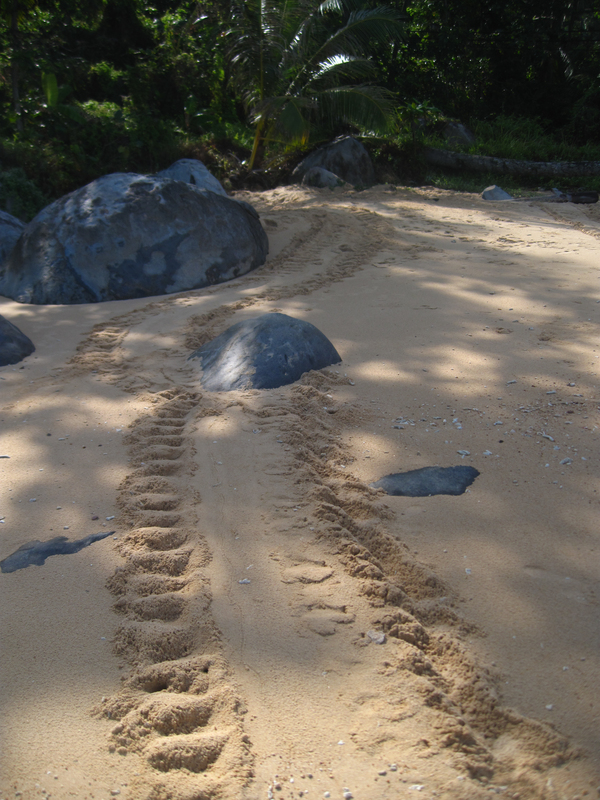 We measured the tracks and determined that it was a different turtle to the previous week. It is really fantastic to know that turtles are still nesting naturally around Melina Beach – it means there is not too much human disturbance in terms of noise and light that has deterred mother turtles from laying their eggs on several of Tioman’s beaches for years now. Female turtles lay their eggs on the same beach from which they hatched – even after years of migration. How they navigate their return nobody knows! Some think they “taste” the chemical signature of the sand when they are released, some think they can use the Earth’s magnetic core. Either way, it is a magical thing that these turtles would have hatched from these beaches decades ago. We hope that the hatchlings from our hatchery have safe beaches to return to when they become parents too! Green Turtle Nests at Melina Beach! She was a Green Turtle already halfway through digging her nest, and we all kept a safe distance away. In the silence of the night all we could hear were the waves and the sound of sand hitting the sea pandan tree as she made her nest. Using a red torch, we kept an eye on her progress. When she had finished laying, and was burying her eggs under copious amounts of sand Ligia, Rich and Sam measured her carapace. It was a dangerous job – the speed of the sand projected by her flippers is extremely harmful to the pores! And though the three have been picking sand out of their ears and hair ever since, it was worth it. Her carapace was a massive 103cm in length and 88cm wide! SJII students were woken from their beauty sleep to watch her return to the sea, but this was a thorough mother they had to wait as she dug a “pit” or false nest – this deters predators that may be after her protein-rich eggs. It was declared unanimously as worth the wait as everyone got to see her make her speedy return to the sea. We underestimate female turtles. This green made a weighty ascent up to the top of the beach, dug a nest, laid her eggs, dug a fake nest, rearranged the sand in the supra-littoral zone, and still had the energy to make a swift and graceful exit that one would expect from something half her size! We were lucky enough to have Asian Geographic Features Editor Jeffrey Kong accompanying SJII, and he took a couple of reference shots for ID purposes. Even he was surprised when he had to keep up with the turtle to get a shot! 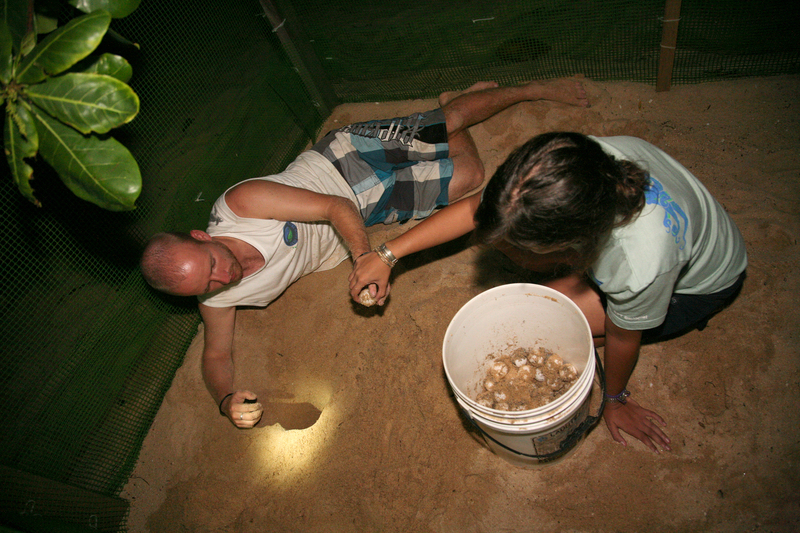 We want to thank Jeffrey for documenting the turtle, and our immediate relocation of the 119 eggs that make up nest 67 – the first of 2010! So ladies and gentlemen, the nesting season of 2010 has officially begun! Lets hope that it is as successful as last year! Thanks to all the schools so far for their kind donations, especially to HKIS for helping to build this years hatchery 🙂 Photo’s of this to follow soon! 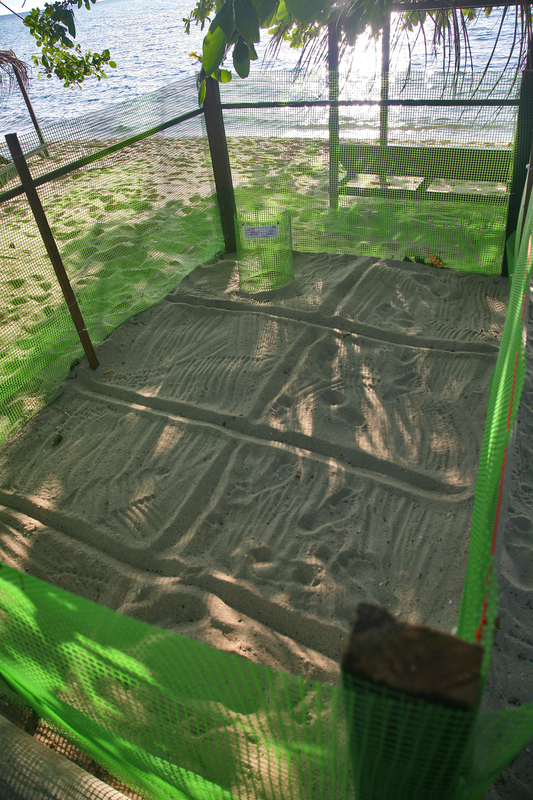 Here is the new Melina Beach Turtle Hatchery video, made in conjunction with Ecofieldtrips. 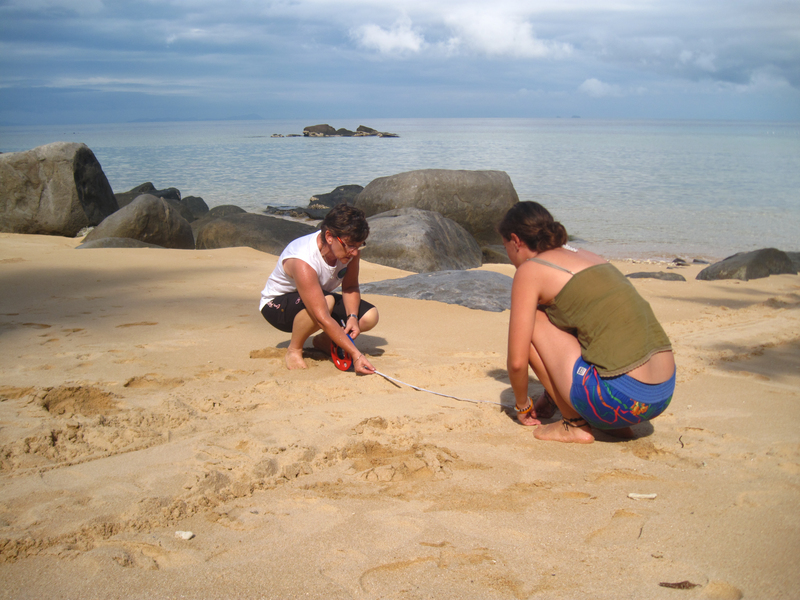 It features footage from our 2009 season, and adult turtles from dive trips on Tioman Island with Ecofieldtrips.